Crowd enjoying the firework display following the light switch on. 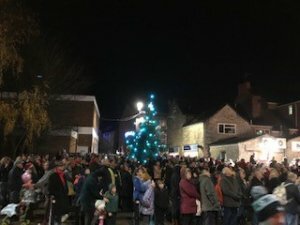 This years Festive Dursley event was a great success with a large crowd witnessing the lights turned on by local singer Ben Nelmes and Charlie Bear (mascot of the Air Ambulance). 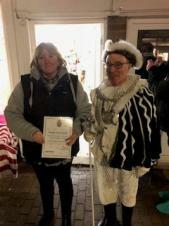 The Town Council would like to thank the members of the Festive Dursley Group who have worked so hard to facilitate Friday's event including Mandy Woodward (Chair), Pam England, Tom Arnold and Mel King. 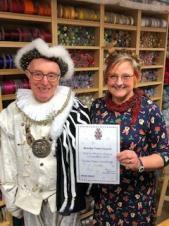 This years winner of the Festive Window Dressing competition was the Mind Shop in Parsonage Street. Mayor Grecian presented the award to Jo Scott-Thomson and Jade Clift. Second place went to Caroline Marrow at Inches and third place to Sharron at the Angel Treasure Trove.Due to the quality of this year's competition, the judges awarded "High Commended" certificates to TSB, Dursley Library, Simply Foot Care, Hunters Estate Agent and a special award to the residents of No. 12 Pederson Close for their charity garden display at the bottom of Long Street. WSP - Sponsors of our Christmas Tree. Ben Nelmes - Switching the Xmas lights on and entertainment. Build it - Assisting with the erection of the Christmas Tree. Cam & Dursley Youth Forum - Judging the Xmas window competition. Chantry Centre - Supply of staging. Classy Glass - Supply of Christmas window winners award. 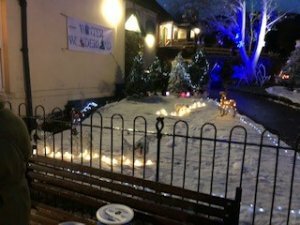 Clifton Cameras - Santa's grotto photographs. Coates Fireworks - Firework display. Cutters Den - Supplying wooden festive decorations for Santas grotto. Dursley Business Inclusive - Supporting the event. Dursley C of E Primary Academy - Choir. Gloucestershire County Council (Street Lighting team) - Allowing use of lighting columns to power festive lights. Great Western Air Ambulance (Charlie Bear) - Switching on Xmas Lights and supporting the event. J & M Entertainment - PA and snow. Rotary Club of Dursley - Marshalling. Simply Footcare - Hosting Santas Grotto. Snow Business - Artificial Snow. Terry Pascoe - Our MC for the evening. The Door Youth Project - judging the Festive Window competition & supporting our young people. Town Trust - Organising the stalls. Tower 22 Training - First Aid. Tree Management - Christmas Tree. If you would like to become involved in planning the 2019 Festive Dursley event, please contact the Town Clerk. The Town Council would like to thank all those who entered the "winter wonderland" themed window display competition. 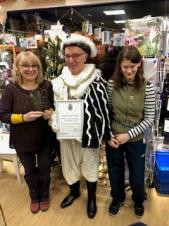 Mayor Neil Grecian presenting first prize to Jo Scott-Thomson and Jade Clift from the Mind Shop in the 2018 Festive Window competition.